Give your television a new pedestal with the Ameriwood Home Lawrence Ladder TV Stand. This gorgeous black ladder-style stand is made from laminated MDF and particleboard and can support a 60” flat-screen TV that weighs up to 135 lbs. 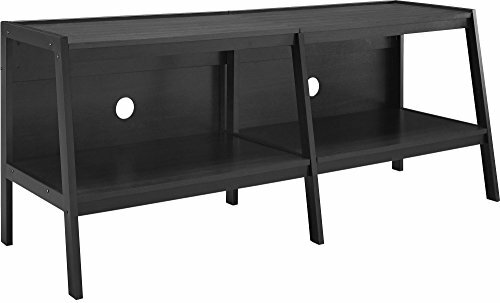 With a spacious shelf underneath, you’ll have space to hold everything from your DVDs and player, gaming console, cable box and other electronics. The back panel is equipped with 2 wire management holes, so reaching outlets is a breeze. Plus, with plastic caps attached to each foot, the TV stand won’t scratch the floor. Assembly is required. When assembled, the stand measures 23.74"h x 60"w x 18.6875"d.